Vintage styling with modern features. The Victrola 6-in-1 Nostalgic Bluetooth Record Player combines all the latest technology at an incredible value. Stream your music, or play your favorite CD, Cassette, Vinyl Record or Radio Station. Belt driven, 3-speed turntable (33 1/3, 45, 78 RPM) plays all of your favorite vinyl records and albums. Wirelessly stream music from your Bluetooth enabled device, up to 33 feet away. FM Radio with nostalgic rotary dial. 3.5mm Aux-In and headphone jack for music from any non-Bluetooth device (cable included). Measures 18.1" x 13.4" x 9.5". 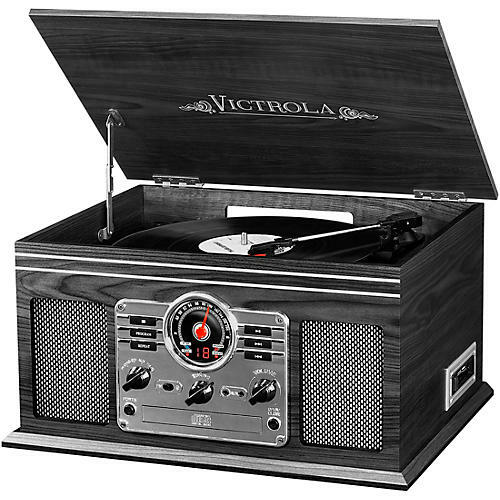 Victrola 6-in-1 Nostalgic Bluetooth Record Player with 3-speed Turntable with CD and Cassette. Play it all with this 6-in-1 system—order today.